The book of art work contains descriptive works in three parts. The first section contains a run of “stills” from an imaginary screen play the artist conjured up. Over time, as the images developed, a sequence of chronological flow, time and story ensued. This all happened by accident but eventually he was able to incorporate all the images into a WWII screen play with two separate operating theaters, Indo-Europe and North Africa. Somehow he managed to weave a story line of five disparted girls and the dilemma of the father being forced to develop biological warfare for the Germans. This is exemplified by the intertwined bug motif. The second section consists of text by the author and links illustrations to the folk tales. It basically was an exercise to prepare for a further book at a later date. The third section remains simply a smorgasbord of backlogged work from the time period 1987-2000. These were included to show the scope and range of his ability. 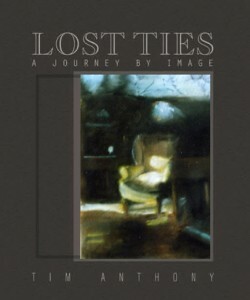 Take a look at the Author’s artwork. The artist, Tim Anthony was raised in Minnesota and studied at the U of M in the late 1960’s, majoring in Psych, Humanities and Art. After another stint out East studying oriental medicine by attending what is now the Kushi Institute in Becket, Massachusetts; he returned to Minnesota and engaged in an alternate life style, settling on small contracted jobs in order to support more artistic but non-paying endeavors. After some time was devoted to the art world again and in lieu of pursuing a degree due to circumstance, he decided to simply put together a folio sampling of work in book form. He thought it may sell and solve the dilemma of making a living from fine art. What has since entered into his art work is a sense of drama from life experiences including literary and film influences. Aside from real world dealings, his retreat to hunting and fishing put a scenic touch to some of his work. Additionally, his landscapes were influenced by a Swedenborg, George Innes supernaturalism, his still lifes by a Chardin like sensorium and the abstracts by a Kadinsky type chaos. The artist’s imagination added to the illustrative feel for the images by coupling text and folk tale and by being a double cancer. He likes mythology.